Longines has been based at Saint-Imier in Switzerland since 1832 celebrates 180 years in the watch making industry. 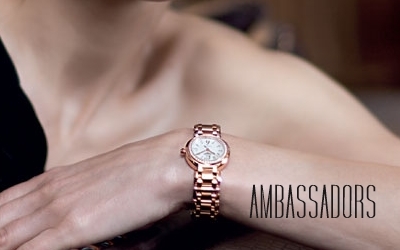 Its watchmaking expertise reflects a strong devotion to tradition, elegance and performance. Longines has generations of experience as official timekeeper of world championships and as partner of international sports federation. 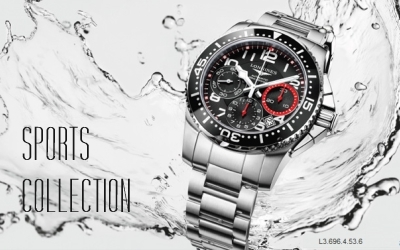 Known for the elegance of its timepieces, Longines is a member of the Swatch Group Ltd, the World�s leading manufacturer of horological products. Longines bases the signature timeless elegance of its products on an aesthetic heritage which it updates and applies with a skilled balance between refinement and classical design. Its timepieces are inspired by the history of technical and stylistic daring of a company which has always been a vast laboratory that continually monitors its creations with a keen eye. With the winged hourglass as its emblem, the brand has outlets in over 130 countries. Longines diamonds are cut in the traditional Brilliant style. The colour of Longines diamonds is Top Wesselton. The degree of purity of a Longines diamond is VVS on the case, respectively VS or SI on the dial. Stainless steel / 18K Rose Gold watch is set with 60 Top Wesselton VVS diamonds, for a total of 0.174 carats and 11 Wesselton VS diamonds, for a total of 0.031 carats. Recoverd from sea shells, treated with care and built it longines watches to give an everlasting beauty. Longines' mother-of-pearl for those looking for a unique watch since each dial is different like a finger print. 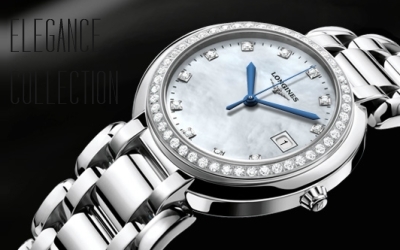 Longines' sapphire are acid resistant, scratch-resistant and practically unbreakeable. The sapphire crystals made by Longines are crystal clear. Because they are made by sapphire and also because the craftmen who make them are skilled in preserving the clarity of this synthetic stone through perfect polishing creating a crystal that cannot be seen. Longines diamonds are cut in the traditional Brilliant style. The colour of Longines diamonds is Top Wesselton. Purity - Almost all diamonds contain minute traces of non-crystallized carbon or small non-diamond crystals. Most are not visible to the naked eye and require magnification to become visilble. These "inclusions" are natures finger prints making a diamond unique. However, the fewer they are, the rarer the stone will be. Ranging from FL - > VVS - > VS - > SI - > I . Weight - Measurement for diamond is carat which is 1/5 of a gram and 1 point being one hundredth of a carat. You need only observe a movement�s intricate mechanism and rhythmically moving parts, the beauty and fi neness of its components fashioned out of steel as well as various complex alloys and even gold to understand that you are looking at a shining example of applied intelligence, brought to life by Nature�s most versatile tool, the craftsman�s hand.Few Longines models have quartz movements as well. Sapphire crystals are more expensive than any other kind, which is not surprising if one takes into account the raw material and the hours of work that are required. But they offer both your customers and yourself considerable advantages. They combine zero porosity with total resistance to acids and alkaline substances and have a hardness of 9 on the Mohs scale. By comparison, mineral glass has a hardness of only 6.5. For our customer this means that the crystal fulfills its role of being invisible. And although it looks very much like one, these watches are far more affordable than a solid-gold models. Ceramic offers remarkable properties. It is scratch resistant, anti-allergic and resistant to all types of chemical attacks, high temperatures, friction and abrasion. Add to this its aesthetic beauty and you have a more-than-worthy candidate for creating a luxurious timepiece. High-tech ceramic combines a timeless elegance and a refined touch concealing a hardness that is difficult to match.